As a citizen of India, it is your responsibility to pay Income Tax, it is also important for you to file Income Tax Return. The last date to File Income Tax Return for the Financial Year 2017-18 is 31st July 2018. The Income Tax Department has time and again notified the taxpayers to file their Income Tax Return before the due date, as delaying this would invite Tax Penalty for you. 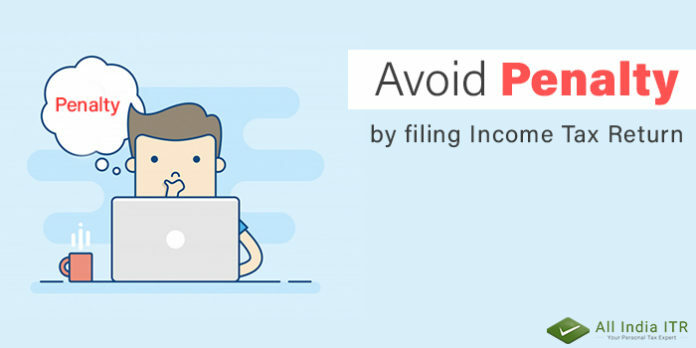 In order to file your Income Tax Return, you can use the Income Tax Department’s official e-filing website and can file your ITR in just a few simple steps. Here are a couple of things that will tell you the importance of filing Income Tax Return. The last day to file to Income Tax Return is 31st July 2018 for the Financial Year 2017-18 and not filing your ITR by this date can leave you with a heavy penalty. If you fail to file Income Tax Return by 31st July 2018 and manage to file it by 31st December 2018, then that case you will have to pay a penalty of Rs.5000. On the other hand if you fail to file your ITR by 31st December then you will have to pay a penalty of Rs.10,000. In case your income is upto Rs.5lakh then you will have to pay a penalty of Rs.1000. While filing your Income Tax Return you will have to keep your important documents like PAN Card, Aadhaar Card, Form 16 and Bank Details handy. Once you file your ITR you will have to verify it, you can verify your ITR by sending a copy of ITR-V to CPC Bangalore or you can e-verify your Income Tax Return. You are required to verify your Income Tax Return within 120days of filing ITR. If you fail to verify your ITR your ITR will be considered invalid. The last date to file ITR is just 10days away, so file your ITR now and get an instant discount of Rs.50 by applying our coupon code ITR50. You can also earn by using our refer and earn scheme, you just have to tell others about us and earn.